Intel® Core i5 Processor i5-8400 OS runs on SSD 120G . Comments: Until now i am very happy with all servers i bought. Pros: The luxRiot engineers are realy on top of the game at the best price possible. 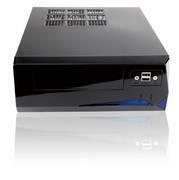 This mini nvr is more powerfull compared to the 4u server other manufacturers sell. The quality and wire management is great. Comments: Thumps up when it comes to support. I was able to get free support on top of the free software upgrades.